Your toddler may contract a gastrointestinal virus that causes vomiting and diarrhea. Most of the time, these viruses pass within a couple of days and can be treated at home. The most important consideration is to keep your toddler well-hydrated by offering clear fluids in small amounts for the duration of the illness. Call the pediatrician if you are worried about your toddler's vomiting. While your child is in the throes of a stomach bug that causes vomiting, do not feed him solid food at all, as he will simply vomit it back up. After he vomits, wait 15 to 20 minutes, then offer him a few sips of a clear fluid, such as water, flat clear soda or an oral rehydration solution, such as Pedialyte or Rehydralyte. If he can keep that down for 15 minutes, give him another couple of sips. Small amounts of clear liquids are often easier to keep down than larger amounts. Once he has gone a few hours without vomiting, offer him larger amounts of fluids to drink. Once six to 12 hours have passed with no vomiting, your toddler is likely to be hungry. Offer her bland, non-irritating foods. 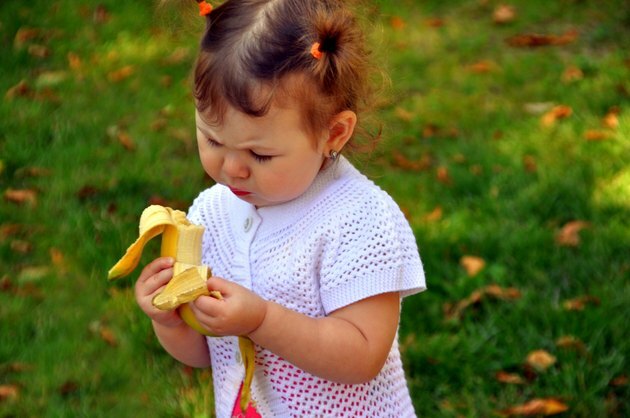 Many doctors recommend the BRAT diet, which stands for bananas, rice, applesauce and toast. Other bland foods are chicken broth, dry cereal without sugar and crackers. Gradually add in other foods over the next day or two, avoiding those that contain a lot of fat or sugar, fried foods or dairy products. Wait to reintroduce dairy products for at least three days after your toddler's last vomiting episode. Also wait several days to reintroduce fatty and spicy foods. Some children do better if you wait even longer, up to a week. It may take her a few days to feel up to eating normally again, so do not force her to eat. Continue to offer plenty of fluids to prevent dehydration. If your toddler shows any signs of dehydration, call his doctor promptly. These signs include scant urine, a dry mouth, no tears when crying and listlessness. If he stops vomiting for 24 hours then starts again, call the doctor. Vomit that looks like it contains coffee grounds may indicate internal bleeding and warrants emergency care, as does a hard, bloated abdomen. If you think that his vomiting may be caused by the ingestion of a poisonous substance, go to the emergency room right away. What Do You Give Toddlers Who Have an Upset Stomach?